Kethil stands 5'8". Her parents are a Desert Elf and a Vampyrri Human(like a dhampir). Her father is currently the avatar of the deity of fate. Her mother is the daughter of the avatar of the deity of Fire, who for some reason is a succubus that is good aligned. She became smitten with a cleric of that same deity and started working on getting him. She is very wealthy and so tends to wear only the finest materials. Through an adventure in an abandoned temple she took up being a cleric of a water god by the name of Nereus. His symbol is a wave forming a cutlass. She commissioned her Holy symbol to be made out of amethyst, sapphire and aquamarine to fit the theme and his colors. She has somewhat pale skin, black hair and amethyst eyes. Her succubus heritage seeps out in her beauty and ability to charm males if she wishes. She generally prefers to wear a dress and tends to wear Nereus' colors now. His colors are ocean blues and purples. She wears her hair down, but in a style that keeps it out of her face in battle. 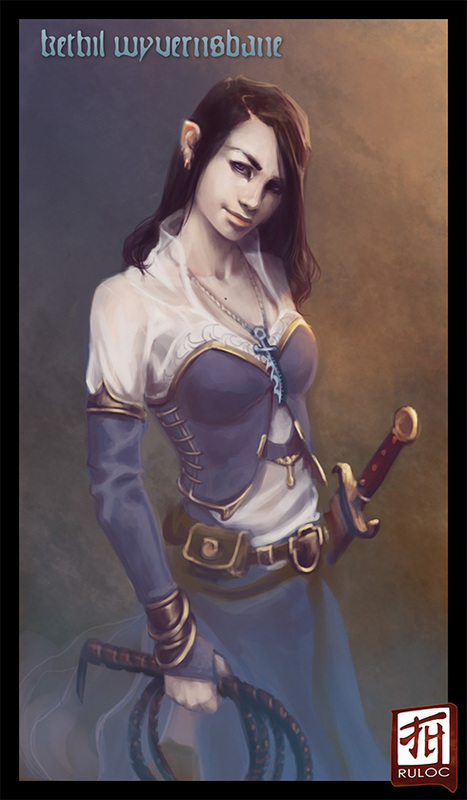 She wields a cutlass and has a whip for when she does not want to get in close.